Getting older can be tough, so it’s important for new assisted living residents to have good friends who can help them along the way. As you know, friendship is one of the most wonderful parts of life, but it can be hard to make new friends when you are in your 70s and 80s. If you and your mother have made the decision to move her to an assisted living facility, you will want to make sure that all aspects of her well-being are attended to, including her social life. As great a caregiver as you are, you cannot be a replacement for good friends. The last thing you want for your mother is for her to feel isolated and lonely in her new home. Although this adjustment can be difficult at first, new friends can definitely turn a house into a home with ease. Getting to know people takes effort, so your mother needs to make sure she is in the center of the action. 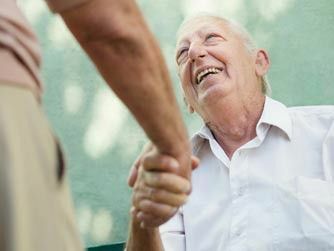 Many assisted living facilities offer programs and activities that foster interaction with others. Be sure to encourage your mother to sign up for events as much as she can, whether it’s taking a dance class or joining a civic or church organization. If you can, have her sign up for something she’s never tried before, such as yoga or painting. Learning new things helps keep senses sharp, so new activities can provide both social and mental benefits. Making new friends is important, but staying in touch is what creates lasting friendships. Bring your mother into the digital age by setting her up with an email or social media account. Another great option for keeping in touch with friends and family is Skype, a free software program that allows users to make video calls to one another. Many seniors are becoming more tech savvy, and this could be an easy way for her to stay connected with friends, both old and new. Does your father enjoy playing pool or chess from time to time? Encourage him to bring along some new friends the next time he wants to hit the billiards room. Maybe your mother likes scrap booking or crafting – which can also easily turn into a group activity. Although your mother’s alone time is valuable, many of the things she loves can further improve her well-being in a group setting. Your mother’s social life is as important as any other part of her well-being. Be sure to encourage her to reach out and make new friends so that she stays happy and healthy. Talk with your community’s General Manager to help make new friend connections and get your parent involved and socializing.